I don’t remember what the dish was but some time last year my friend asked me how I got a certain dish to have a full rich yummy flavor. I just smiled. I didn’t tell her. Yeah, I felt guilty. But I still kept it to myself and decided to bear the guilt a while longer. Maybe you’ve heard of UMAMI. I won’t get too technical (here’s an article if you want to go deeper) but it’s a flavor profile like SOUR, SWEET, SALTY, etc. And it makes food absolutely irresistible. Processed food contains chemicals to create UMAMI and get you hooked on that food. The more of it that you eat, the more of it you want. MSG is one of these chemicals that is added. Well, it’s bad news. Read ingredients and avoid it! But guess what… some foods and combinations of foods contain a natural form of MSG that give the same irresistible umami flavor. And if you know how to wield them in your kitchen, you can really take your homemade food to the next level. 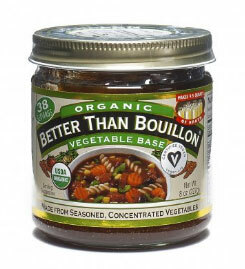 Instead of plain salt, I often use Better than Bouillon base. Even if a recipe doesn’t call for any broth, I will add this paste to give dimension to my cooking. And my absolute favorite is the VEGETABLE one. It has the best profile, and it doesn’t taste like vegetables (oh, I’ve tried containers of vegetable broth – this is nothing like that, ugh). We carry the organic varieties of BEEF, CHICKEN and VEGETABLE at SC Real Foods. You can use actual foods too to boost UMAMI too. Here’s a short list – Beef, Mushrooms, Tomatoes, Soy Sauce, Parmesan Cheese, Fish Sauce. You don’t have to like the food to put the flavor in. Get creative and hide these flavor layers in your dishes. If you’re using the right amount, the specific flavor is undetectable. Now, it’s not in the list but I’m adding smoked bacon. Yep. Now your friends can ask about YOUR FOOD and you can just smile and keep your secret.